Two bowl granite topmount sink. Includes integrated accessory ledge on sink rim, one stainless steel bottom grid to protect sink bowl, and waste fittings. Kindred Granite sinks feature smooth Durakleen finish to ensure ease of cleaning, and a patented Sanitized Silver<sup></sup> compound for added hygiene even between cleanings. Two bowl granite top mount sink. Includes integrated accessory ledge on sink rim, one stainless steel bottom grid to protect sink bowl, and waste fittings. Kindred Granite sinks feature smooth Durakleen finish to ensure ease of cleaning, and a patented Sanitized Silver<sup></sup> compound for added hygiene even between cleanings. Two bowl granite undermount sink, with small bowl right hand position. Includes integrated accessory ledge on sink rim, one stainless steel bottom grid to protect sink bowl, and waste fittings. Kindred Granite sinks feature smooth Durakleen finish to ensure ease of cleaning, and a patented Sanitized Silver<sup></sup> compound for added hygiene even between cleanings. 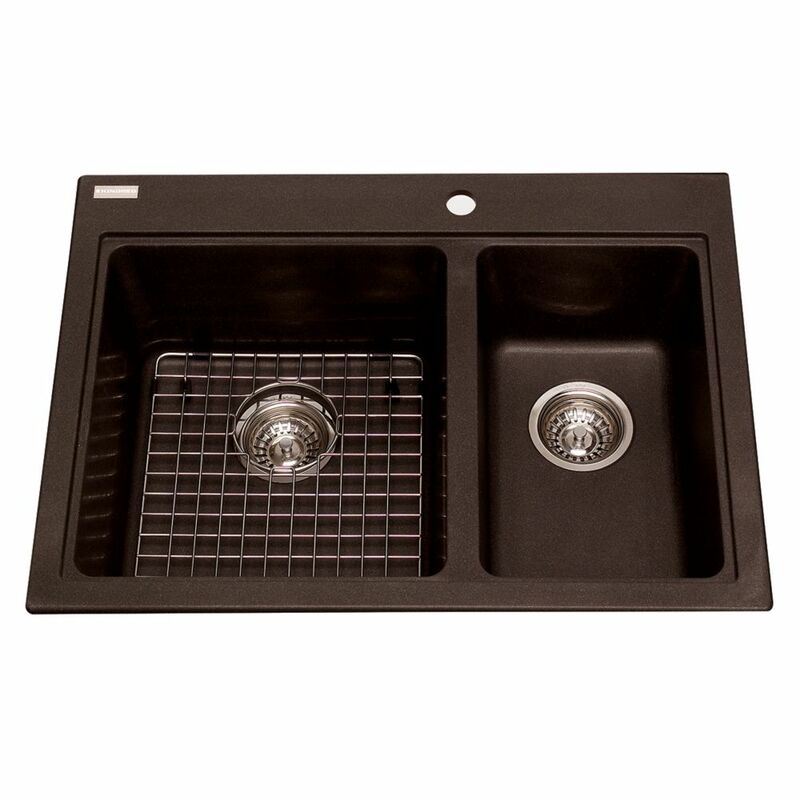 Combination sink Espresso Two bowl granite topmount sink. Includes integrated accessory ledge on sink rim, one stainless steel bottom grid to protect sink bowl, and waste fittings. Kindred Granite sinks feature smooth Durakleen finish to ensure ease of cleaning, and a patented Sanitized Silver<sup></sup> compound for added hygiene even between cleanings. Combination sink Espresso is rated 2.0 out of 5 by 1. How many holes does this sink have? I need 4.